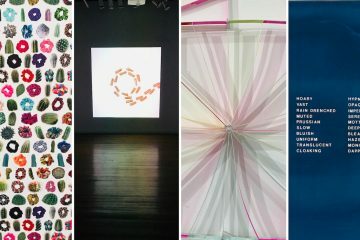 |’sindikit| project space was founded around a conceptual framework that challenges artists to stretch their practice into uncharted and experimental territories. 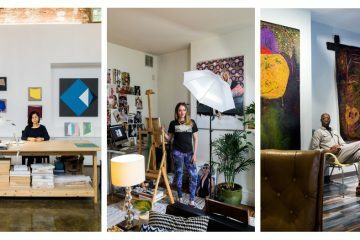 The curatorial duo behind it, artists Tom Doud and Zoë Charlton, require exhibiting artists to stretch beyond the comfort zone of the medium they’re known for, in order to try something new. 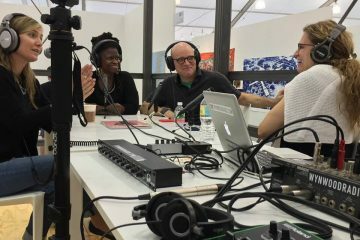 Whether a new medium, new situation, new context, this bet on artists’ ingenuity crafts not only a framework of risk for the curators, but for the audience as well. At |’sindikit|, there is a shattering of expectations for the artists you may be familiar with, and for those less familiar maybe an introduction that may not open the door you thought it would. In the group exhibition Painting Not Painting, eight artists and a collaborative partner take the gallery’s prompt to challenge the boundaries of their own practices in relation to painting. Many of the artists are known for some broad relation to painting, yet here some push into 3D or towards digital, fall back into the comfort zone of painting or get to a core sensibility of their work. For example, upon entering the gallery a table set up by artists Sabina Ott of Chicago and Kelly Lloyd containing a selection of ceramics and some random objects. Originally, at the opening the table was full of small handsome white ceramic containers that the two artists had made and lined up in a grid. This piece is less about painting, or even about ceramics, because this is a piece about exchange. 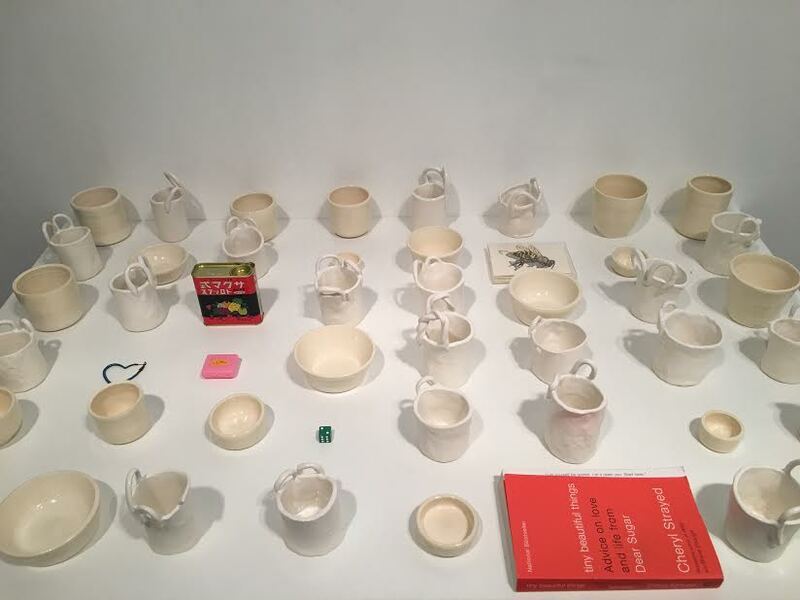 The audience is invited to select a ceramic from either artist and give something of their own, when I saw the exhibition a few weeks after the opening it was littered with dollar bills, books, and pocket lint, with just a few ceramics remained. Ott, known for her sculptural antiformal architectural installations (and for co-running Terrain Exhibitions outside Chicago) and Lloyd for her conceptual installations that use video, drawing, and giftbaskets, reduce their practice to this essential metaphor: give and take. Rush Baker is familiar for his staccato mixed media abstract paintings, yet with “Discarded Signs for a Lost Campaign,” he presents the broken and defaced political signs of his own failed political campaign. 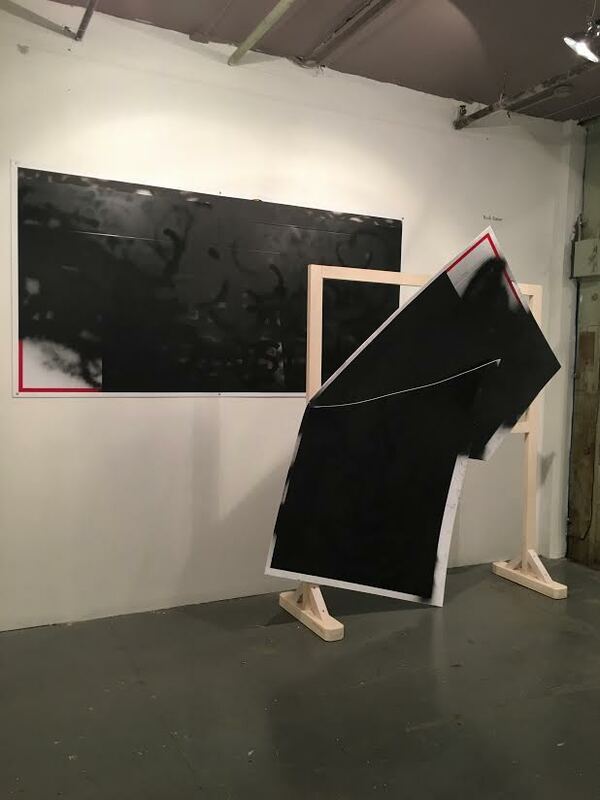 Like a vandalized, or further destroyed Steven Parrino, Baker voids his own effort, blacking out his name or any trace of his accomplishment. These monochrome annihilations stay within a level of painting but use the ground as the element of change imbuing meaning to failure. Eschewing the paint of paint, Chicago-based artist and eponymous project space director, Dan Devening, displays four paper collages titled “Portal.” Similar in formal investigation to his painted mixed-media work, though here he forgoes the tight execution to rely on paperclips to hold these pieces together. 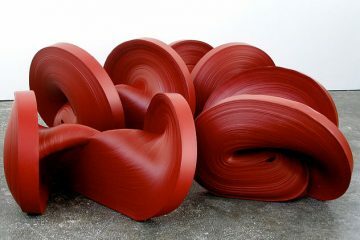 They feel like the formal study for his work, related to his practice, but more casual and, even, vital in that they reveal a lot about his own work and their construction. Paolo Arao is known for his labored hard edge abstract works, that base themselves on systems of time, for example a painting a day or an hour. 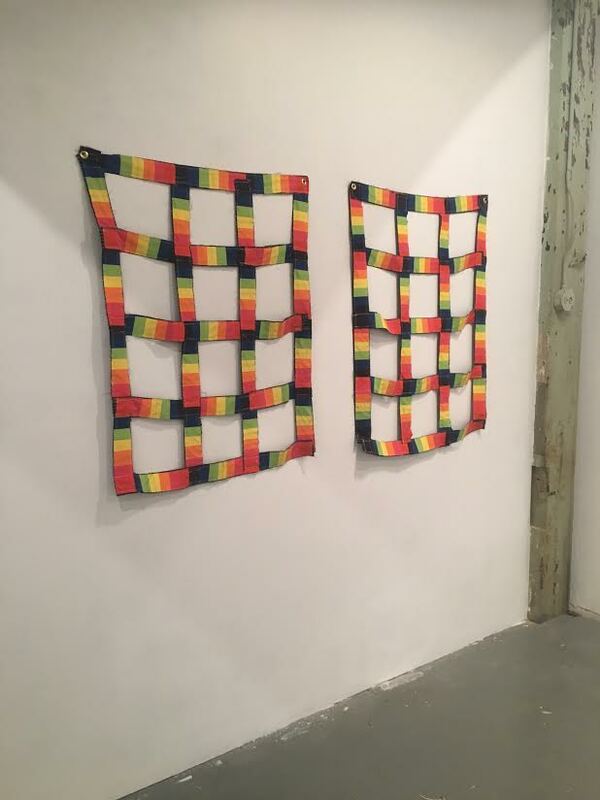 In this exhibition he does away with timetables and also his usual acrylics and color pencils for fabric in “Happy Endings,” a pair of skeletal rainbow fabric grids. They sag slightly, drawing attention to the system of voids cut from within, owing something to a happier and more solid Supports/Surfaces work. It’s a happy medium, familiar to the work we know but brave in its risk. 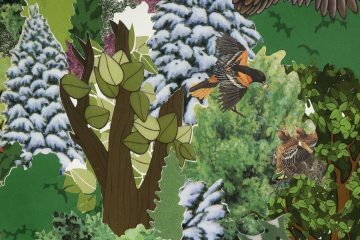 Perhaps the largest impression is made by Jo Smail, a Baltimore based artist known for mixed media collages. 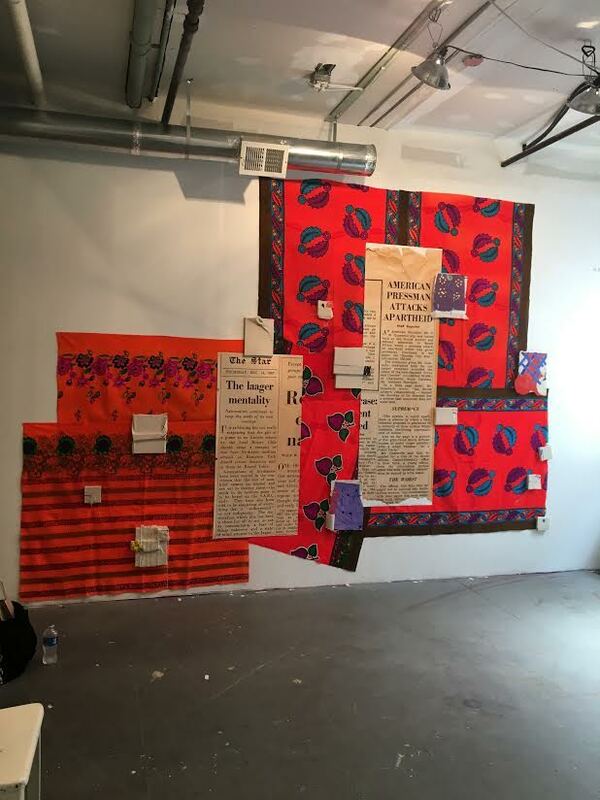 In her “I Bought a Bag of Memories” installation the collage explodes over bright fabrics, digital scans from the reverse sides of recipes and small works on canvas. This bright cloud combined with the found nature to the printed material dwarfs the canvases, almost treating them as secondary or some detritus to the other materials on consideration. Of many of the pieces in the exhibition, this one feels as if it is the most transitional, speaking the same language as Smail’s previous works but expanding the vocabulary and rife with potential. 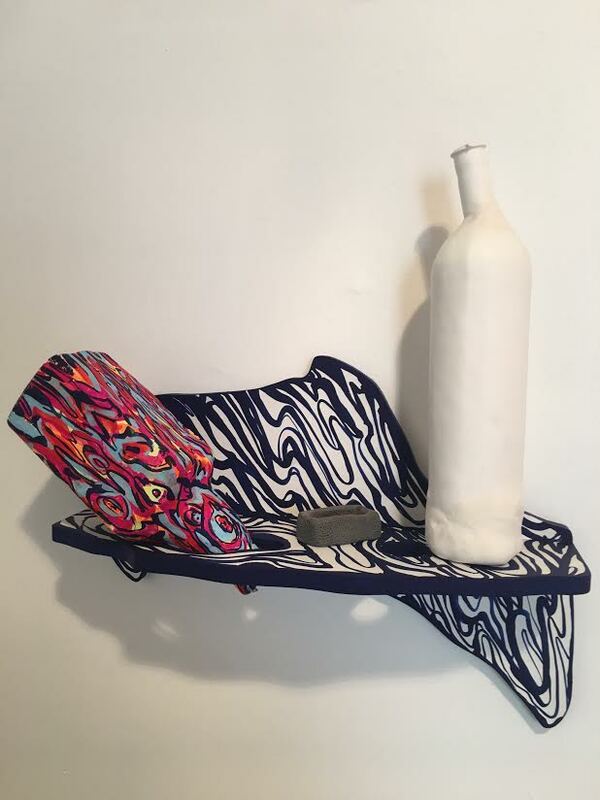 The shelf itself is painted in the same fashion as the work in her practice, with a contribution of a white bottle from collaborator and friend Elliot Doughtie. And if anything the reduction of scale seems to be the element most attuned to the theme even though it negates the painting itself. 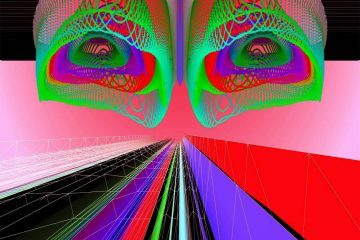 For the last year or so New York artist Sharon Butler has been generating digital drawings as the course for her abstract oil paintings. 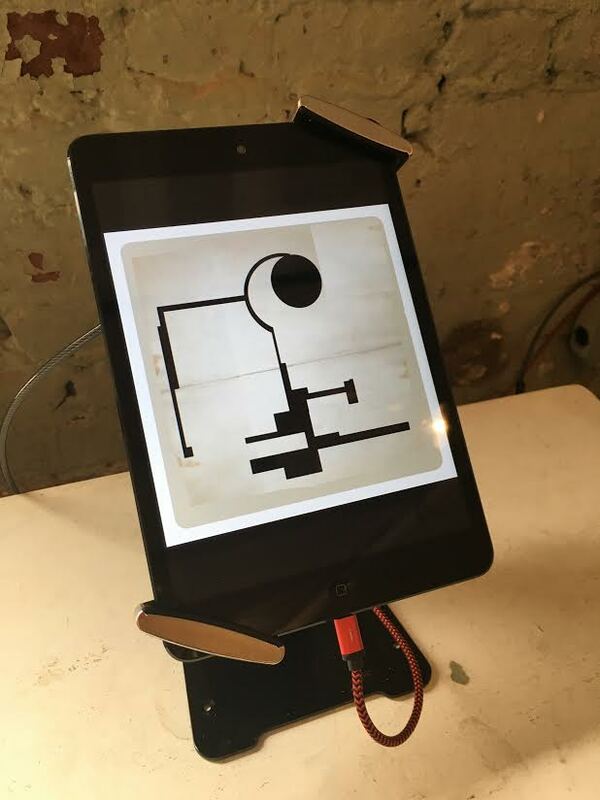 On a small device we see a moving slideshow of her digital images, generated with Illustrator and phone apps, move before us. Not exactly an animation, but there is a sequence. 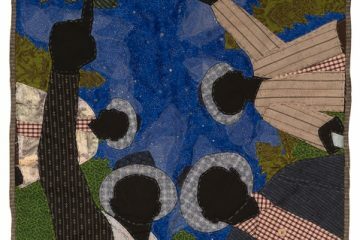 As with Devenings pieces, the body of work is refocused by a new context. ‘Painting not painting’ has a tall order, just to reiterate the driving force behind |‘sindikit|’s larger goals: to challenge painters’ practices. Most artists spend decades even settling on what their practice will be, and are themselves beholden to its shifts and evolutions, with twists and turns both planned and unexpected, a balance of intuition and interrogation. All of these artists in Painting Not Painting (and the curators) should be commended for focusing on the boundaries of painting and accepting this challenge. There appear to be rewards waiting on the other side of this test. Author Terence Hannum is a Baltimore based writer, visual artist and musician. Painting Not Painting is on exhibit through August 26, 2017 at |’sindikit|.